One of the most valuable and memorable experiences a student can have in their lifetime is the opportunity to meet an inspirational figure. Furthermore, to be able to relate to that inspirational person on some level or another, students are provided with a memorable experience and also given the mindset that tells them to believe in themselves. All students should be given the chance to listen, engage, and absorb the knowledge, advice, and encouragement that motivational speakers provide. It allows them to hope. It gives them inspiration and encourages them to follow their dreams and goals in life, whatever they may be. 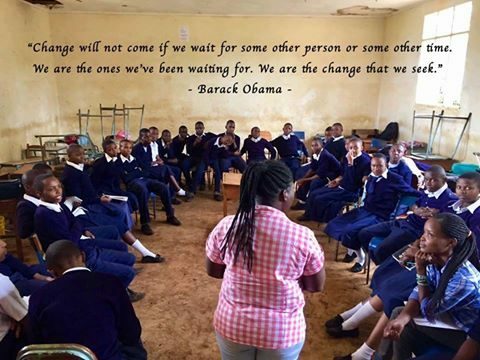 During the Girls Impact Project in Moshi, a young woman named Sophia Simon was invited to talk with a class of students at a local Secondary School. She graciously spoke to the students in the third person about how a young individual had to overcome a series of challenges to become a General Manager. She specified that this person had graduated secondary school at the age of 23 and went on to study travel and tourism management and become the general manager of one of the most renowned lodges in Moshi. When she revealed herself as this particular individual, the students were in awe and respect. She demonstrated perseverance and gave the class an example of how achieving your dreams’ is not an easy journey, but it is possible with dedication and patience. Furthermore, she was an encouragement, especially for the female students, because her personal story was an example of a woman who independently challenged social norms and made a career for herself. This was critically important because during several of the exercises we conducted throughout the week which focused on career options and skills, I noticed that many of the students still retained the idea that women were confined to a certain spectrum of aspirations. For example, many believed women were solely apt for jobs such as cooking, cleaning, caring for children, etc. Another trend which many students had believed was that career-wise, most women were more likely to become teachers or doctors. These are, of course, fantastic paths to pursue, however, it is important to teach students that they are not limited to such few options. It is crucial that these students recognize their potential and know that there is a range of different career paths for them to pursue. Francis Romani Selasini, another motivational speaker and Executive Coordinator of NAFGEM (Network Against Female Genital Mutilation) – a local partner of African Impact – was able to visit the class shortly after Sophia, and he spoke passionately about the efforts he has made to this day in order to put an end to female genital mutilation. His presence and determination were evident in the classroom and the students absorbed his every word. He carefully explained how FGM is a gravely serious violation of human rights, which specifically targets girls and women. FGM is acknowledged internationally, yet the practice continues to affect a large number of women due to deeply-rooted social and culture norms. It is a form of discrimination against women and of femicide. There are no health benefits from the procedure – which Francis made very clear after the question was asked by a female student. These types of open discussions and inspirational talks are a necessary component in every classroom. It allows students to broaden their minds, ask important questions, and gain insight into the many different issues that are still present today. A very special thank you to Sophia Simon, Francis Romani Selasini and of course, African Impact & The Happy Africa Foundation for the continuous support, motivation, and dedication that is delivered to these beautifully enthusiastic and devoted students!